Dr. Raymond W. Brullo, DPM (Ray Brullo) is a Compliance Officer in the Office of Medical Devices Radiological Health Operations, Division 3/West. He is based in the FDA Los Angeles District Office, Irvine, CA. He reviews case evidence for regulatory decision-making for the Office of Regulatory Affairs (ORA) and interfaces with the Center for Devices and Radiological Health (CDRH). Previously, he was an FDA Investigator in the Bioresearch Monitoring (BIMO), Biologics, and Medical Device program areas. Dr. Brullo attended Loyola University of Chicago, receiving a B.S. in Biology. He graduated from the Rosalind Franklin University of Medicine and Science earning a Doctor of Podiatric Medicine degree. He served a foot surgery internship in Iowa from 1983-1984. He maintained a private practice and hospital surgical privileges from 1984-2002 in the Chicagoland area. 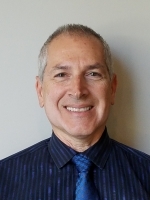 Dr. Brullo’s areas of interest from his Podiatric career are medical devices used in lower extremity support, wound care, orthopedics/surgery, and peripheral vascular applications.